I'll spare the title's philosophical implications for another occasion, and get straight to the point. Creative Sources was among the first imprints to present works by artists honestly willing to travel the no man's land separating sound from silence. For this, Ernesto Rodrigues' label is respected by this reviewer in spite of the latter's repudiation of similarly oriented music in recent years. I have spoken at length on the insincerity of certain assumed milestones � in reality, forgettable albums � by composers and/or improvisers who fabricated a trend for exploitable audiences (and, not infrequently, built rewarding careers on absolutely nothing). As of today, it is hard to find useful words for a release moving around those coordinates. But here we are. 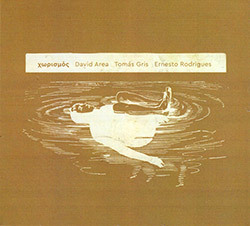 Chorismos comprises a single track lasting about 47 minutes. The instrumentation � electronics, guitar, harp and objects � may have been completely different and, most probably, the outcome's aural philosophy would not have changed. This is in fact a classic example of recording whose pace and dynamics appear to be dictated more by environmental resonances and surrounding activities than a player's transitory intention. In the initial part of the piece, protracted stretches of quietness act as a container for remote city echoes before a sparse counterpoint is formed. It's a rather expectable representation of the genre: plucked string clusters, infinitesimal crackling, gentle touches, irregular electronic noises. As the time elapses, the background activity retains its influence � motors and sirens calling for our attention � while Area, Gris and Rodrigues attempt to increase both their acoustic presence and the sheer number of gestures to distil substance from the interplay. This change originates brief sections in which one can better measure the instrumental nuances against the impalpable reverberations from the outside. However, no real surprises materialize; the record ends like that, a fragment of fragility in the endlessness of normality. Ultimately, a doubt lingers on: perhaps the trio purportedly chose this kind of action to emphasize the concept of separation implied by the album's denomination. Did they just consider themselves an interface between diverse mechanisms in a sort of "cosmically metropolitan" snapshot? After repeated listens, I'm still none the wiser. Lowercase savants are not going to be denied, though; everything herein will give them pleasure.